Welp, it happened. I have hit that burn out wall again. I have been pushing myself like crazy in all aspects of my life again and I am feeling the burn bad. I am going to have to put some things aside for a bit, and I am sad to say this blog will be one of them for now. My goal for August is easier said than done, but here goes nothing. I tried to take some "me" time in July and it just didn't happen as much as I wanted it to. Between wedding planning, work commitments, family, and everything in between, I literally am pulled as thin as I can take comfortably without breaking down. 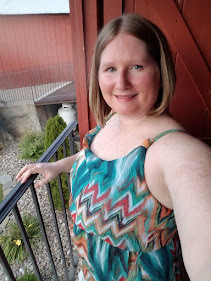 I had my bridal shower over the weekend and would love to talk about it. I will. It just may have to wait til September. Maybe that is appropriate as it is my wedding month. Maybe that will be something fun to do all month. Something for me to look forward to when I come back to the blog. For now, I am taking August off. I have already missed the first week of it, so it was a good time to say, I need a break. I will be popping in from time to time to read blogs and maybe do something here, but I am making no promises. I need to learn to let things go to recharge, and this time I'm going to stick to it.